The town of Scoville likes it hot! Very hot! That means they love their peppers - but they're too busy eating them to grow the peppers themselves. That's where you come in. You've been hired by the town of Scoville to meet their need for heat. Your role as an employee of Scoville is to crossbreed peppers to create the hottest new breeds. You'll have to manage the auctioning, planting, and harvesting of peppers, then you'll be able to help the town by fulfilling their orders and creating new pepper breeds. 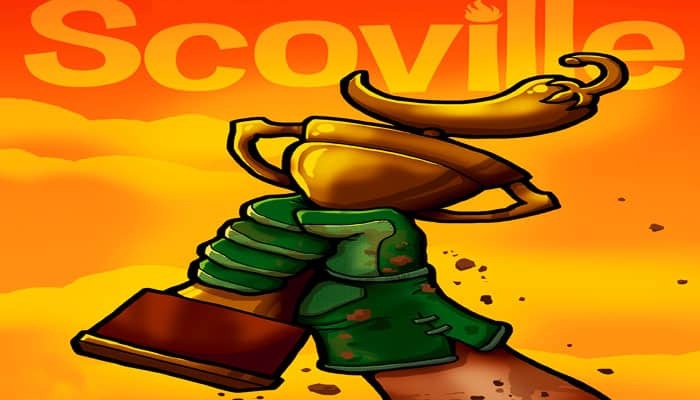 Help make the town of Scoville a booming success! Let's get planting! A round of Scoville consists of a blind auction, which determines player order, a planting phase, a harvesting phase, and a fulfillment phase. Each round, the players plant peppers in the fields. Throughout the game, the available opportunities for crossbreeding increase as more peppers are planted. When harvesting, players move their pawn through the fields, and whenever they move between two planted fields, they harvest peppers. If, for example, they harvest between fields of red and yellow peppers, they crossbreed those and harvest an orange pepper. Harvested peppers are then used to fulfill the town's peppery desires! Wilbur Scoville was born on January 22nd, 1865. The world would never be the same. In 1912 Scoville developed the Scoville Organoleptic Test (SOT), which was used to measure the "hotness" of peppers. Scoville's test is still used to measure the capsaicin in a pepper, expressed as Scoville Heat Units. Ever since, people have tried to breed hotter and hotter peppers. Each player gets 3 Bonus Action tiles to start the game. These tiles are kept behind the player screens. They may be played on the player's turn to take advantage of the tile's benefit, and are discarded when played. Players should discard the tiles face up in front of their own player screen so that everyone will be aware of which tiles have been used.